Saxifragaceae (Saxifragales) contain approximately 640 species and 33 genera, about half of which are monotypic. Due to factors such as morphological stasis, convergent morphological evolution, and disjunct distributions, relationships within Saxifragaceae have historically been troublesome. The family occurs primarily in mountainous regions of the Northern Hemisphere, with the highest generic and species diversity in western North America, but disjunct taxa are known from southern South America. Here, we integrate broad gene (56 loci) and taxon (223 species) sampling strategies, both the most comprehensive to date within Saxifragaceae, with fossil calibrations and geographical distribution data to address relationships, divergence times, and historical biogeography among major lineages of Saxifragaceae. Two previously recognized main clades, the heucheroids (eight groups + Saniculiphyllum) and saxifragoids (Saxifraga s.s.), were re-affirmed by our phylogenetic analyses. Relationships among the eight heucheroid groups, as well as the phylogenetic position of Saniculiphyllum within the heucheroids, were resolved with mostly high support. 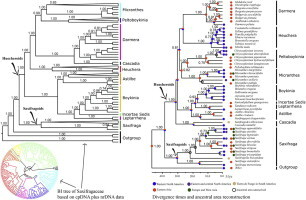 Divergence time estimates indicate that Saxifragaceae began to diversify ca. 38.37 million years ago (Mya; 95% HPD = 30.99–46.11 Mya) in the Mid-Late Eocene, and that the two major lineages, the heucheroids and saxifragoids, began to diversify approximately 30.04 Mya (95% HPD = 23.87–37.15 Mya) and 30.85 Mya (95% HPD = 23.47–39.33 Mya), respectively. We reconstructed ancestral geographic areas using statistical dispersal-vicariance (S-DIVA). These analyses indicate several radiations within Saxifragaceae: one in eastern Asia and multiple radiations in western North America. Our results also demonstrate that large amounts of sequence data coupled with broad taxon sampling can help resolve clade relationships that have thus far seemed intractable.